The full range of 50 colours are available in 37ml tubes and some whites are also available in 120ml & 200ml tubes. Winsor & Newton have over 170 years of experience in the making of oil colours. The choice of raw materials, formulation and manufacture of Griffin Fast Drying Oil Colour reflects this experience and provides a product of absolute excellence. The vehicle (oil modified alkyd resin) allows the colour to dry quicker whilst retaining the other characteristics of conventional oil colour. As with all Winsor & Newton colours, every colour in the range is individually formulated to take advantage of the natural characteristics of each pigment and to ensure the stability of the colour. Because alkyd resin has physical properties that differ slightly from those of traditional oils, the pigment load is somewhat different as well. Experienced painters will notice slightly greater transparency compared to Artists' Oil Colour. The colour has been formulated to offer the greatest degree of tinting strength possible (consistent with good handling properties), and to take full advantage of the true characteristics of each pigment. We use single pigments wherever possible to create individual colours. Combined with strength of colour, single pigments provide a wide colour range in themselves and offer cleaner, brighter mixtures with infinite hues. This is particularly important for violets, greens and oranges. Single pigment 'secondaries' considerably broaden the artists' available spectrum. As the cost of the pigments used varies, so does the price charged for the colour. Therefore we have grouped colours together in 'series'. The higher the series number, the higher the price. You can find the series number both on the colour chart and on the tube. Not all colours in the range are transparent. Pigments vary in their transparency by nature, and Griffin colours are marked as T or (transparent), ST or (semi-transparent), O or (opaque) or SO or semi-opaque on the colour chart (the level of transparency of a colour is relative to other colours in the range). Griffin Fast Drying Oils offer a slightly more fluid consistency than traditional oils. Alkyd colours dry to a more even reflective surface than traditional oils. The highest quality raw materials and superior manufacturing standards are employed in formulating this range. The result is that, providing the artist uses sound painting techniques, oil and alkyds should share similar life spans. AA and A rated colours are recommended as permanent for artists' use. Please refer to the permanence ratings provided on the printed colour chart and the tube labels. The most outstanding advantage of the Griffin Fast Drying Oil Colour is the speed of drying. Depending upon your technique, you will be able to complete a picture in a fraction of the time required for a traditional painting. All colours in the range remain workable on the palette for 4 to 8 hours, and are touch dry on the canvas in 18 to 24 hours. The drying time will be affected by the thickness of the paint and the temperature of the environment, however. Thorough drying prior to varnishing is essential, and should be a minimum of three months in thin films of colour. 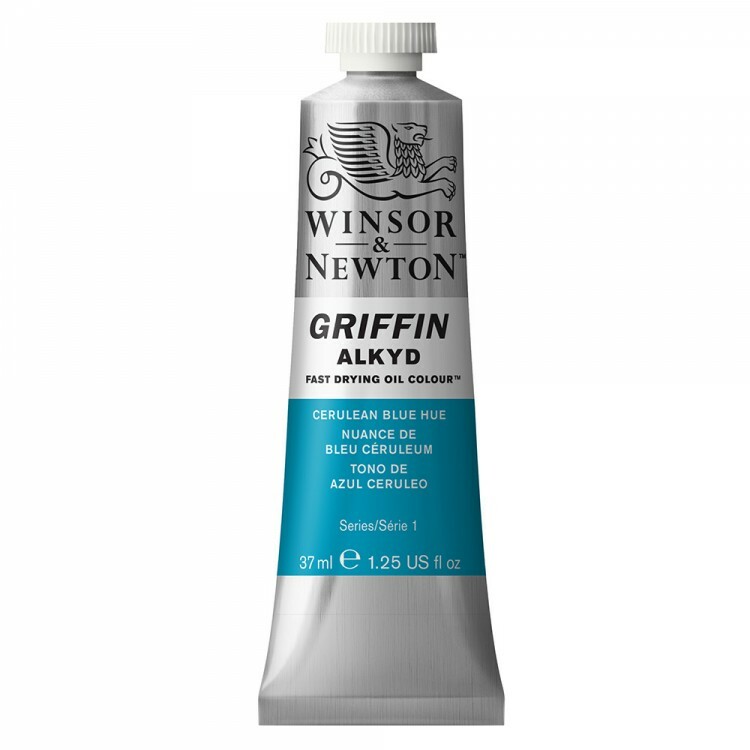 Speed of drying makes Griffin Colour ideal for using at college, art school or in art society environments and also for examinations, painting outdoors or on holiday.